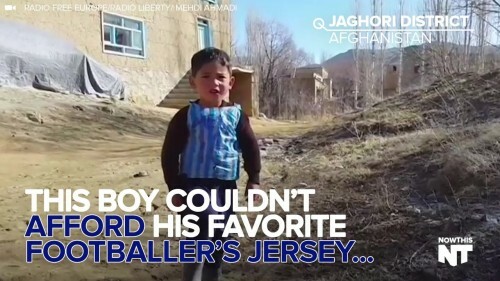 Murtaza, just five years old, is a huge fan of soccer. His favorite player is soccer star Lionel Messi. Murtaza lives in the Jaghori District in Afghanistan. His family couldn’t afford a jersey (we don’t blame them jerseys are expensive) so they decided to make him one instead. Murtaza and his brother used a little ingenuity, and a lot of plastic bags, to make him a plastic jersey that looks like Messi’s. They even wrote his name and number on it. This just goes to show you that even when you can’t afford something with a little ingenuity and creativity you could make it happen!